Oviedo, FL: As I was on a hunt in my tiny backyard for the mourning doves I kept hearing, I spotted this guy. I was stealthily ducking and bobbing low hanging branches so as not to alarm the birds and as I was about to move toward the fence the light caught his web just right. The weather is beginning to cool so there are fewer and fewer spiders. Some will make their way onto the patio tucking into corners and under pots, others will somehow finagle their way into the house to hide behind bookcases. The rest will simply disappear until spring. Until this year, I hadn’t seen too many of this particular kind of spider, the Orchard spider or more technically Leucauge venusta. Now I see them everywhere. They’re harmless to people and pets, eating only small garden pests. 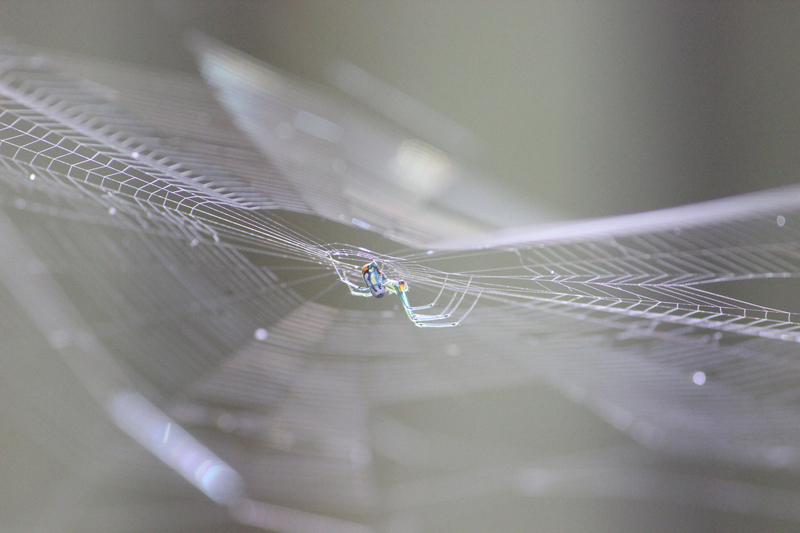 Beautiful and colorful, they weave intricate and often layered webs. I am happy to make his acquaintance, and I’ll miss his colorful addition to my yard when the weather becomes less hospitable for him. But I will look forward to his return in the spring.